Miranda July’s Me and You and Everyone We Know is a refreshing and disorienting film that celebrates life and love in a extraordinary way that, by the end, will leave you wanting more. Web-of-life films are starting to become a very popular genre in the new American cinema. These movies have a variety of characters wandering through individual narratives, oblivious that they are connected by a larger story that remains concealed to the audience until the dramatic arc brings them to the surface. Paul Thomas Anderson’s Magnolia and Robert Altman’s Short Cuts, for example, are my personal favorites. Often, this style of filmmaking boasts many incredible performances by well-known actors. Yet in this indie picture, our leading roles are played by either newcomers or relative unknowns. Even with these new talents on the front line, the acting is marvelous, all the way down the board. This is July’s first feature film, and hopefully not her last. She pulls off a perfectly calibrated grace that is so unexpected it’s almost breathtaking. As a contemporary artist, she has written a few short stories and has acted in a few minor roles, but hasn’t really made herself a name in the business until now. 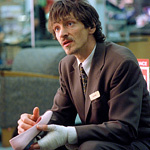 John Hawkes (The Perfect Storm, Identity), who looks like a goofy version of Vincent Gallo, is put in the spotlight as the protagonist, Richard Swersey. This character’s charm and wit is so delightful you hope from the beginning that things will work out for him. Swersey is a shoe salesman who’s separating from his wife and is uneasy about being a father. His sons, 14-year-old Peter (Miles Thompson) and 6-year-old Robbie (Brandon Ratcliff), are internet freaks that spend a lot of time in online chat rooms. Christine, played by July, works for a taxi service driving elderly people around town. She is an offbeat performance artist and is desperately trying to get her work into a major museum. Most of her pieces correlate to the other characters, even though she’s never met them. At times her pieces are foreshadow a character’s decisions ahead. Christine meets Richard in his shoe department and she falls head-over-heels for him. At first, he is skeptical about being involved with her, but he slowly discovers that she is exactly what his life needs. Surrounding these two are numerous other characters who play a small part in the big picture. Nancy (Tracy Wright), is a mean-spirited woman who works for the museum; she sports a dark secret that will surly have you choking on your popcorn. Swersey’s neighbor, Andrew (Brad Henke), a sexually frustrated man who has a forbidden obsession with teenage girls, also has a sad, yet touching, tale. What all of these diverse, peculiar characters have in common is a yearning for human connection and a desperate need for self-actualization. The affiliation between all of them plays out beautifully. The end in particular is so heartwarming, I wanted to watch it again as soon as the credits started rolling. There is a spectacular trend that plays out through the entire film. Each scene educes a specific mood in the viewer, but whether it is sorrow or happiness, July never ceases to make us laugh. For instance, when Christine is driving an elderly man from the mall, they see a man on the freeway who had left a goldfish he had bought for his daughter on the roof of his car. They both know that the fish is going to eventually fall and die, so Christine insists that they say a few words in memory before the poor thing meets its demise. The scene plays hysterically, yet has a sad undertone; you’re not sure if you should be laughing or crying. Although July hasn’t had experience directing feature films, her skills are impeccable for such an amateur filmmaker; her script is rich, touching and funny; the cinematography is stunning; the directing is creative and intimate. Michael Andrews has to be mentioned for the fantastic original music. His electronic score works perfectly with many of the scenes, especially during the more moving sections of the film. Me and You and Everyone We Know received the Special Jury Prize for Originality of Vision at the 2005 Sundance Film Festival, as well as other awards at the Philadelphia and San Francisco International Film Festivals. While it is getting the recognition that it deserves, I can already predict that it will never see an Oscar. Its much too obscure for the Academy Awards, though I believe it will surely be one of the best films of 2005. This film is mesmerizing, gorgeous, emotional, funny and never slow, I can say without a doubt that it’s the best film I’ve seen all year.